A few weeks ago, I did a blog post on finding cheap solar cells on eBay. I wanted to see how many listings of inexpensive solar cells are there in eBay. So I went to eBay and did a search. As usual, to find the solar cells, I just type in the phrase “solar cells” on the search box and hit the “Search” button. When I did the search on July 23rd 2009, there were a total of 1348 results. Most of the results are a mixed of solar related books, tool kits, solar chargers, solar fan, etc. There are a couple of solar cells offers that I noticed. To find the PV cells is pretty easy. All the listing come with a small picture. This makes the browsing process easier. 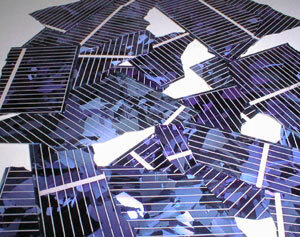 To locate the solar cells offers, just look for the picture that resembles PV cells. When you come across these offers, some of the cells are quite expensive. Here’s a trick that I learned from Michael Harvey of Earth 4 Energy e-book, look for cracked or chipped solar cells. As it turn out, cracked or chipped solar cells are not totally unusable. Some of them can be repaired while other can still produce electric current but with less efficiency. If you are looking for inexpensive PV cells for your DIY solar panel, use this criteria for your selection. I spent about half and hour going through the results and I actually found 7 good deals. You can see the screen shots on the top. So what’s the next step? It is time to place your bid. Remember, in order for you to start bidding, you have to register as a user with eBay. Assuming you’ve won the bid, you want to make sure the selling price is inclusive of shipping and transport charges. Since the solar cells are not in the best condition, you have to go through each and every cell to physically check its working status. I know this can be a pain but that’s the only way for you to save money on your home solar power project. A complete residential solar power system is made from multiple components. There are many places where you can find cheap parts for your project. All you need is to know where to look for them. If you are looking for ideas on how to save money on your renewable energy project, remember to check out Earth 4 Energy e-book. The information in the manual is priceless and can save you thousands of dollar. I am the kind of hombre who loves to seek unprecedented things. Presently I’m fabricating my personal photovoltaic panels. I am making it all alone without the assistance of my staff. I’m utilizing the internet as the only way to acheive that. I came across a very awesome website that explains how to make solar panels and wind generators. The website explains all the steps needed for solar panel construction. I am not really sure about how precise the information given there is. If some guys over here who have xp with these works can have a look and give your feedback in the site it would be great and I would extremely value it, because I really like solar panel construction.